Welcome back to Mary's Adventure Sweater, aka the sweater knit without a pattern, consistent yarn weights, or matching needle sizes. Today we'll be talking about measurements. They may not guarantee that the finished product will look nice or even fit, but that's the Adventure part. Why let a little uncertainty stop you? Then there's the worst calculation of all - the one for set in sleeves. How early to cast off? How to get just the right slope? 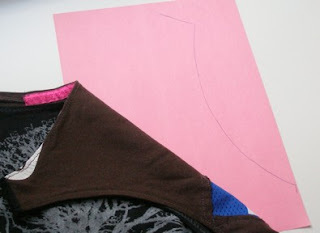 How to get the slope right for the back (where the body of the sweater tends to be wider) and the front (narrower) - and then get the sleeve to fit perfectly too? For this sweater, the most important measurements are the bust and the distance across your shoulders from arm to arm. 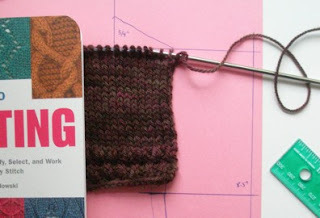 Once you've got those noted and used your gauge swatches to calculate how many stitches you'll need to have on the needles for those bits, you can advance to the cheating stage. Yes, there is a cheat! And it involves a garment already in your wardrobe that fits you perfectly and makes you look great. In my case, that would be a dress made from recycled T- and hockey shirts by Susan Harris. Truth is, even that much effort is just to give you an idea of what to expect. 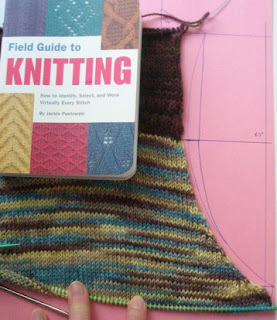 You can also lay down your knitting as you go, to ensure that you are in fact following the correct curve with your increases, or in my case, decreases. Remember that whatever you do on one side of the piece, you do on the other as well. 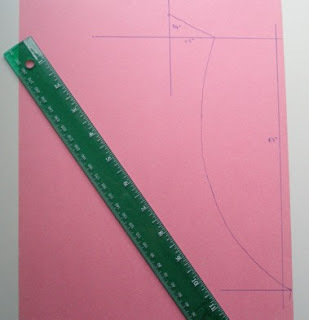 Yes, I am working upward in the solid from a little less than halfway down the arm opening and working downward in the stripe to get the rest of the curve - hence the horizontal line on my tracing sheet. Something I've learned from this experience: if you're working downward and increasing in a big way for the bottom of an armhole, do it right on the outside stitch rather than trying to leave the outiside stitch for the selvedge. No selvedge is pretty enough to compensate for the pucker that results. 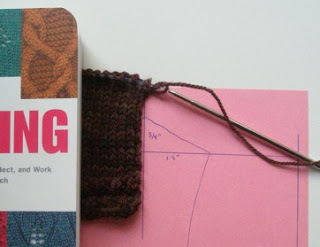 Thanks for joining me and my solid-in-every-way assistant, The Field Guide To Knitting. Come back next time for Stitch Pickup! I am far too lazy to design set in sleeves (I'm all for drop shoulders). your explanation is wonderful- I may work up enough ambition to give it a shot.